Although most coverage of Hollywood news is (rightly) focused on the... ahem... international incident ongoing and its fallout, there is still a weekend to talk about, with new releases and everything. Pity their marketing departments. Settling old business first: The Hobbit: The Battle of the Five Armies opened on Wednesday with $24 million and change (okay, some of that is from showings on Tuesday night). This is without qualifications an impressive number for a two and a half hour movie on a weekday night, and puts it in a similar landscape with The Two Towers (but also, The Matrix Revolutions, so...). As this is the first of the Hobbit movies to open on a Wednesday, we're in a bit of uncharted territory, but the analogous behavior seems solid, with better-than-expected reviews lifting it slightly. It appears as if we've gotten a strong(er) finish than we expected, but it's still a situation where we're finishing it out of obligation more than genuine excitement. I'll stick with my $64 million prediction for the weekend – still an easy win, but not one that comes without any criticism. 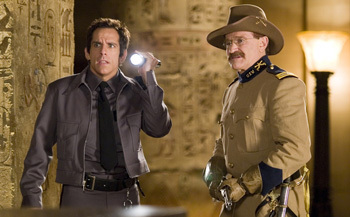 Leading into totally new-to-us films (kinda): The Night at the Museum franchise concludes (we think) with Secret of the Tomb, which brings back most of the characters from the past two Museum films in a globe-spanning adventure to save some magical artifact or whatever and seriously does anyone over the age of 10 actually care? Anyway, Ben Stiller leads the resurrected Smithsonian exhibits, spanning the length of human history, to recapture the magic tablet from Lancelot, who is unaware of the danger it possesses. With the exhibits behaving ever erratically, and attacking patrons as they fade into insanity and dementia (hey hey, kids! ), it's a race against time to fix everything.